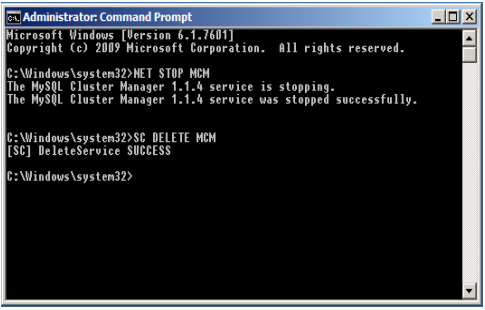 After installing the MySQL Cluster Manager Agent as a Windows service, you can start and stop the agent using the Windows Service Manager. The installation also configures the agent to start automatically whenever Windows starts, and to shut down safely whenever Windows shuts down. 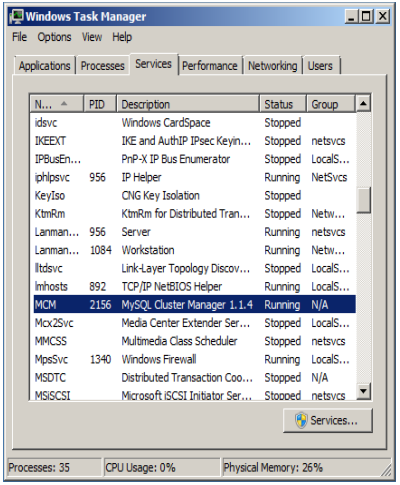 The Windows service can be used to control the running of MySQL Cluster Manager agents on a single host only. To shut down agents on multiple hosts, you can use the stop agents command in the MySQL Cluster Manager client. See Section 3.7, “The stop agents Command”, for more information. The installation is performed using the command prompt (cmd.exe); as with installing or removing any Windows service, it must also be done as a user having sufficient permissions, such the system Administrator account. If the account you are currently using has Administrator privileges, you can simply start cmd.exe. Otherwise, you must run the command prompt program as the Administrator. To do this, first locate a shortcut to the command prompt. On most Windows systems, you can do this using the Start Menu. Find Programs (or All Programs, in some Windows versions), then navigate to Accessories. Under Accessories, right-click on the Command Prompt menu item. 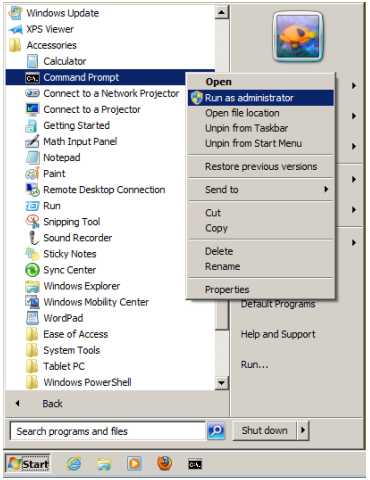 From the context menu that appears, select Run as Administrator. You can see how this looks on a typical Windows system in the next figure. If a Windows UAC dialog referring to cmd.exe appears, click Yes to allow the command prompt to run as Administrator and thus to continue. You should now have a command prompt window open on your desktop, running a session with Administrator privileges. 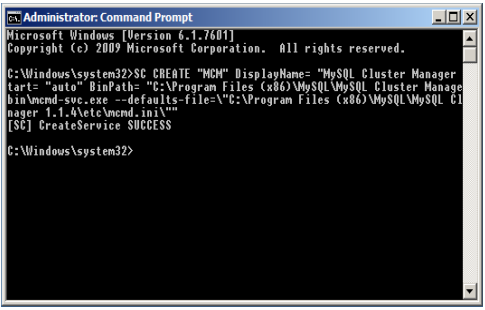 To install the MySQL Cluster Manager agent as a service, we use the SC CREATE command. This command allows us to specify a name for the service (for use in NET START and NET STOP commands), a display name (to be shown in the Service Manager), a startup mode (automatic or manual start), and a path to the executable to be run as a service. (Use mcmd-svc.exe rather than mcmd.exe as the executable.) The path must also include any arguments needed by the program; in the case of MySQL Cluster Manager, mcmd-svc.exe must be told where to find its configuration file using the --defaults-file option. Both of these paths must be absolute. Installation of the MySQL Cluster Manager agent as a service is recommended. However, you should not install MySQL Cluster processes (ndb_mgmd.exe, ndbd.exe, ndbmtd.exe, mysqld.exe) as services on Windows hosts to be used as MySQL Cluster nodes under management by MySQL Cluster Manager, since the MySQL Cluster Manager agent itself controls MySQL Cluster nodes independently of the Windows Service Manager. "MCM" DisplayName= "MySQL Cluster Manager 1.1.4" Start= "auto"
--defaults-file=\"C:\Program Files (x86)\MySQL\MySQL Cluster Manager 1.1.4\etc\mcmd.ini\""
In addition, you should keep in mind that the spaces after the equals signs following the DisplayName, Start, and BinPath arguments are required. 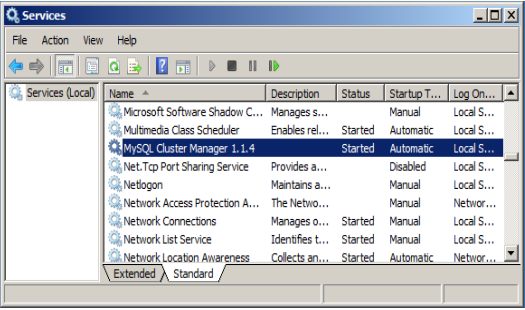 The Service Manager also allows you to start, stop, or pause the MySQL Cluster Manager agent service manually using a GUI. When first installing the MySQL Cluster Manager agent as a service, the service is not started automatically until Windows is started. If you do not wish to restart Windows, then you must start the service manually using either NET START on the command line or the graphical control provided in the Windows Service Manager. If the service is running at the time that SC DELETE is executed, the removal of the service takes effect the next time the service is stopped. In such a case, you must stop the previous instance of the service manually, and allow it to be removed, before you can reinstall the service. Once you have installed the MySQL Cluster Manager agent and the service is running correctly, you are ready to connect to it using the MySQL Cluster Manager client. See Section 2.6, “Starting the MySQL Cluster Manager Client”, for information about how to do this.